Superbly located on a hillside, the 'Casinhas de Loureda' enjoy magnificent views overlooking wooded countryside and the River Vez. The two houses date back to 1896. They have been very carefully restored in order to preserve the traditional exterior granite walls while the interiors reflect all the features and comforts of modern design. Both villas have been beautifully decorated with a modern and colourful design. The 'Casinhas' are located approximately 20 metres from each other and are completely independent and secluded. 'Casinhas I' has a fully fitted kitchen with 4 hobs, oven, fridge/freezer, dishwasher, microwave, expresso coffee machine, kettle and toaster. The living room has 2 sofa beds, LCD television, DVD player and a large French window that opens to a terrace with a table seating 4 people, very pleasant for a meal on a sunny day. There is a double bedroom with ensuite bathroom. On a lower floor, there is a suite with double bed, bathroom and a small lounge with a sofa bed suitable for a child. There is direct acess to the garden. 'Casinhas II' has an open plan kitchen which is also equipped with 4 hobs, oven, fridge/freezer, dishwasher, microwave, expresso coffee machine, kettle and toaster. The living area has a sofa and LCD television. There is a double bedroom with ensuite shower room. On the floor below and acessed from the outside there is another double bedroom with ensuite shower room. Each room has a chaise longue where 1 adult can sleep comfortably. There is a laundry with washing-machine. Both Casinhas de Loureda have central heating. 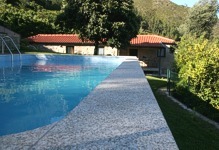 In the garden of Casinhas I, there is a swimming-pool, barbecue and sun loungers. This is the perfect place to relax while enjoying the magnificent views. Casinhas II has a covered terrace with a table seating 6 people, a barbecue and a swimming-pool. The town of Arcos de Valdevez, with shops and several good restaurants, is approximately 15 minutes away by car. Just a 5 minute walk is the Vez river which is surrounded by a beautiful, natural landscape which is a delight for walkers. There are many interesting places to visit in the area, such as the historic towns of Ponte da Barca, Ponte de Lima and Viana do Castelo. Portugal's only National Park, Peneda Geres, is at a short drive. This remote and unexplored mountainous wilderness is also ideal for walkers.